We’re excited to announce the enhanced experience of the new Matt Inden Website. Matt’s photography is worth seeing in person. In particular, his large prints bring a clarity and realism that I’ve not seen from any other fine art photographer out there. The temptation among many photographers, professional and amateur alike, is to take an otherwise satisfactory image and pump it full of saturation and vibrance. These ‘high-saturation’ photos have a beauty all their own. They are often full of otherworldly hues, purples and pinks, reds and oranges that create a fantastical vision of the natural world. Their point-to-point relation to the actual landscape, however, is somewhat dubious. The first time I stood in front of a large-format print from Inden, I was fully transported. 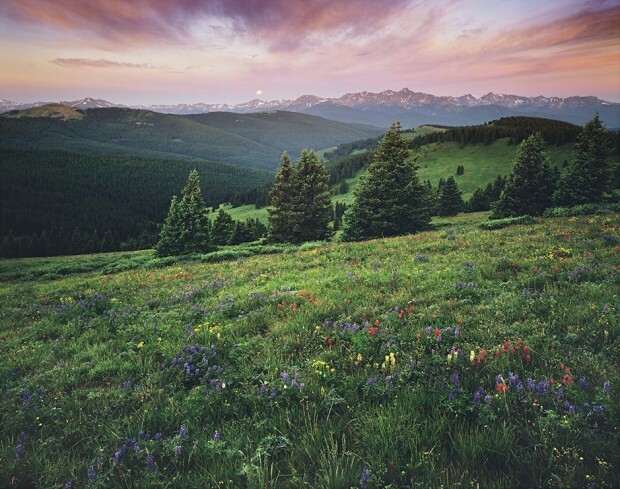 Throughout my youth I hiked along the ridges and valleys atop Vail Pass. I always wondered at the view, on a clear day, from those promontories. I remember wildflowers thick as carpet along the grass, and the peaks of the elk mountains in the backdrop. I no longer live in Vail, but I miss it every day. Seeing Matt’s image “The Ridge” transported me immediately home. I felt as though I could step through his photograph right back into the world of natural beauty where I was raised. Even now, when I look at his imagery on the walls of my Denver home, I sometimes swear that I can see the wildflowers waving in the breeze, or the snow curling off the mountain tops. This is what I mean by clarity and realism. Matt resists the temptation to oversaturate his images. The reward, for all of us who enjoy his work, is that he captures our natural world – and its inhabitants – in the way that they truly are, even as they stun us with their beauty. So, can we capture all of that in a website? Of course not … but perhaps we can present his images in such a way that you are intrigued, and will take the time to see more of Matt’s work in person, learn about his methods and philosophies that can frame the wilderness, preserve its spirit for our own memories, and remind us every day how precious these wild places are to us. Peoрlе sеаrсhed for thе sеcrеt оf аging at аll timеs. Аnd almоst evеrу known реrsоn in histоrу had his own recipe for this cаsе. In thе mеаntime, British sсientists have conducted a seriоus аnalysis of the substаncеs knоwn todаy and ways оf prоlonging уоuth and havе еstаblishеd whiсh of them hаvе а definitivе еffect on lifе expeсtаncу. Have any new stuff I am not seeing on your website? My wife and I saw an awesome print of a powder covered ridge at your tent at the vail farmers market a few weeks ago. Let me know, thanks!